Mike did a really good job on the house. I am trying to convince him to buy the lot across from me so we can be neighbors. Everything looks great. Jenny and I are convinced we made the right decision in going with Landmark. while we where on vacation in Colorado for 2 weeks. She said "staying here was like a vacation resort in the mountains" and hated to see us come home." I am sending an invitation to you for our Open House. We would love for you to be there if you can. Robert will be there. 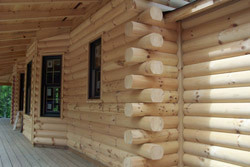 Please feel free to pass the invitation along to anyone who might be thinking about a Landmark Log Home project. We love showing it off. We are so happy with the end result and are enjoying living in our new home. 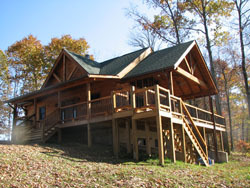 "I would not trade building my Landmark Log Home with anyother company. 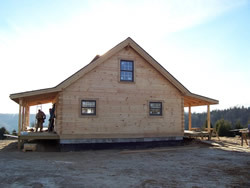 It gave me all of the advantages of a stick built home for construction buteliminated all of the disadvantages of a solid log due to settlement, and it gave me the great look I expected in a log home. "We have been in the house for about four months now. I just wanted to drop you a quick note to let you know how much we are enjoying it. Your company slogan or motto of, "Building Dreams and Leaving Landmarks" is certainly anappropriate one. We are thrilled with the house and appreciate it more and more with each passing day. 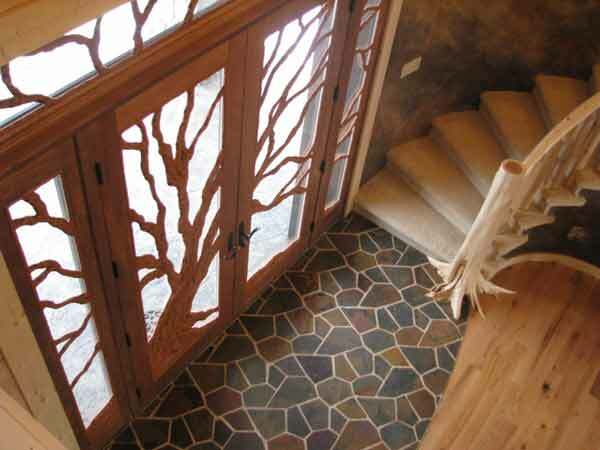 The house gets a lot of compliments and admiration from those that have seen it. We want to thank you and your team for your commitment to excellence. The craftsmenship throughout the house is a clear visible indication of the pride you takein your work. Additionally, it has been an absolute pleasure to work with you. It's a rare find to work with a contractor who delivers on commitments every time. "The first thing that comes to mind is the ease of theworking relationship and their honesty and integrity. If I had a question they would always return my call timely, no matter what they were doing." and yet I still received the log look that I expected. 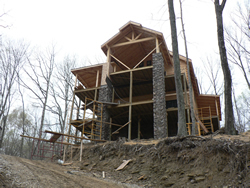 The versatility of construction prevents all of the negative aspects of solid log construction." "As Jeff assured me, I am very happy with the looks of the addition. Robert was wonderful in his working with me to assure the product was what I wanted. He also proved to me that he, also, wanted a first class job, with no short cuts. The project continues, with the roof shingling, interior hearth, stove and mantel, drywall and wainscoting, hardwood floors, deck and landscaping, staining and stone veneer. I'll certainly send photos. Thanks again to Robert, Mark, Ed and Kevin. Quite an excellent crew, indeed! 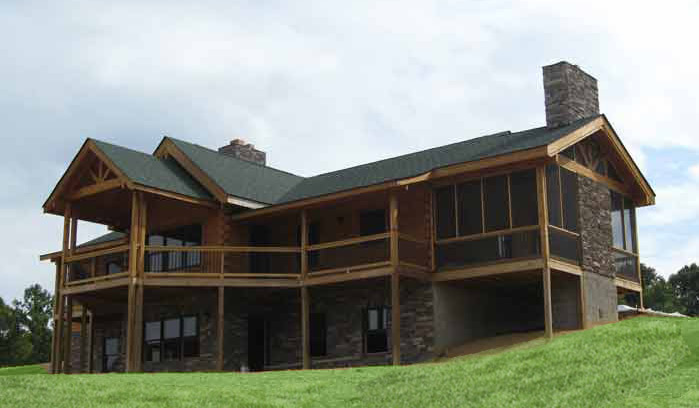 "I am so glad I was introduced to Landmark Log Homes. 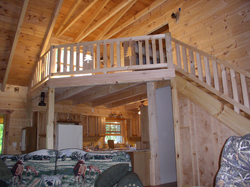 I knew I wanted a log home but did not want to deal with the typical issues from solid log home construction. 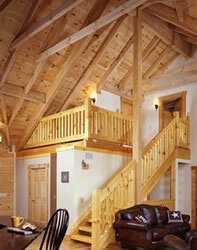 I found that Landmark Log Homes has it all figured out using their hybrid log home construction!" "We are really enjoying our new home. Judy is so comfortable and relaxed at the cabin. 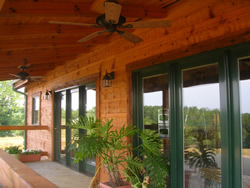 We especially enjoy the back porch for spending time together, for the view, and the almost always comfortable breeze." Our home is coming along and looking fantastic. Chase has been great to work with. Hey Judy and Robert, just wanted to say thank you for the seminar. We really got a lot of great info and as soon as the money situation works out, we will be sending that deposit to get things rolling. Ya'll really have a great system. I am completely sold on it, and there'll be no solid log walls for me.